An extremely rare animal known as the "Asian unicorn" - in spite of having two horns - has been caught by villagers in Laos. No biologist has ever reported seeing the rare Saola in the wild and there are none of them in captivity. The animal was discovered in the forests of South-East Asia as recently as 1992. There have only been a few photos of the Saola taken so far, by villagers and automatic camera traps. The Saola - Pseudoryx nghetinhensis - is believed to inhabit the Annamite Mountains of Laos and Vietnam, and that is where villagers from Laos' central province of Bolikhamxay caught the unfortunate adult male earlier this August. They brought the mammal back to the village. Surprised by the odd-looking animal, the villagers took a few photos and notified the Lao authorities. But by the time a team from the Bolikhamxay Provincial Agriculture and Forestry Office reached the remote location, the Saola was dead. "The death of this Saola is unfortunate," said a spokesperson of the provincial conservation unit of Bolikhamxay province. "But at least it confirms an area where it still occurs and the government will immediately move to strengthen conservation efforts there." In 1992, biologists declared the Saola a news species after analysis of its physical features and DNA. It resembles the antelopes of North Africa, but is believed to be more closely related to wild cattle. The Saola is listed as critically endangered on the International Union for Conservation of Nature (IUCN) red list of threatened species. Only a handful have reportedly been sighted, mainly by the local population. "At best a few hundred survive, but it may be only a few dozen. The situation is critical," said William Robichaud, coordinator of the IUCN Saola Working Group. The technical team took the carcass to the provincial capital Pakxan for further analysis. "Our lack of knowledge of Saola biology is a major constraint to efforts to conserve it," noted Pierre Comizzoli, a veterinarian with the Smithsonian Conservation Biology Institute. "This can be a major step forward in understanding this remarkable and mysterious species. It's clear that further awareness-raising efforts about the special status of Saola are needed but Saola doesn't have much time left," added Mr Robichaud. 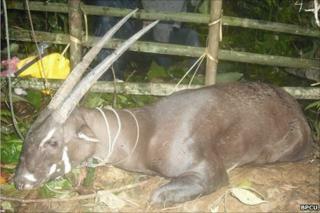 The Lao authorities have urged villagers not to capture any Saola, and if they do, immediately release the animal. "This incident highlights the importance of Laos to global wildlife conservation. Saola and several other rare endemic species are found almost nowhere else in the world," said Latsamay Sylavong, the national representative for the IUCN Lao programme. "Our knowledge of them is limited, and in Laos we need to improve protection of both the ecosystems and the special species they hold, like the Saola. Much needs to be done."